chance of breakage when the antenna contacts objects while the vehicle is in motion. SkipShooter® antennas are the most durable wire-wound antennas on the market. (co-phased) configuration on any vehicle made from any type of material. 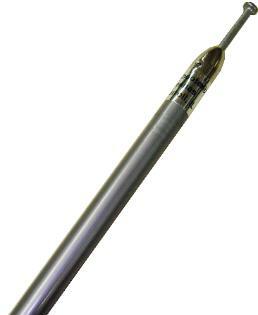 The tuning rod on all SkipShooter® antennas is easily accessible if tuning is needed. See Technical Information for details. fits all standard antenna mounts. Each antenna is covered with a water tight sleeve.